Sunflag (T) Ltd is the only versatile vertical integrated textile manufacturing facility based in Arusha – Tanzania. Sunflag (Tanzania) Limited is a fully integrated textile and clothing company located in Arusha (Tanzania). Established in 1965 the company employs over 2700 people from all walks of life and has the rate distinction of operation since its commencement. 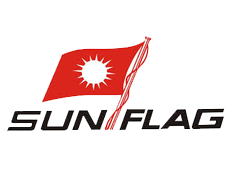 The foundations of the Sunflag Group were laid in the early 1930’s by our visionary Chairman (Emeritus) Mr. Satya Dev Bhardwaj, when he set up the first knitting factory in Kenya. Over the past seven decades the group has never looked back. Today its operations span the globe with manufacturing facilities and offices in the United Kingdom, Tanzania, India, Thailand, Kenya, Nigeria, USA. To deliver the best service and quality at globally competitive prices all the facilities in each country are separate profit centers operating independently of each other.